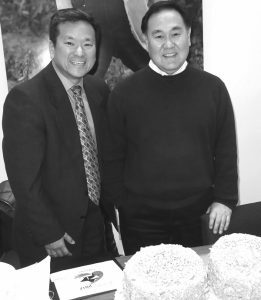 JACL National President Gary Mayeda, left, and Interim Executive Director and Midwest Regional Director Bill Yoshino. The JACL National Board convened in San Francisco on Feb. 11 to discuss its current state of affairs, as well as recognize the contributions of Interim Executive Director/Midwest Regional Director Bill Yoshino, who will be retiring in March after more than 30 years with JACL. In his report, National President Gary Mayeda summarized that JACL has been involved in numerous activities since July’s National Convention. Foremost among them is the 75th anniversary of E.O. 9066. and JACL’s sponsorship of the new Smithsonian Museum of American History exhibition. Mayeda also officially welcomed new NCWNP District Governor Carol Kawase and PSW District Governor Marissa Kitazawa. Meeting highlights included JACL’s successful implementation of the new “Youth Legacy Project,” funded by the National Park Service, which sends two groups of 20 students each year to Manzanar and Los Angeles’ Little Tokyo to learn about the incarceration experience. This year’s trips are set for July and August. Members of the JACL National Board in attendance at the Feb. 11 meeting. First row, from left: Gary Mayeda, Matthew Farrells, Robert Barton, Alan Nishi, Jeffrey Moy. Standing, from left: Jane Komoto, Michelle Amano, Michelle Yoshida, Sheldon Arakaki, Betsy Sato, Carol Kawase, Colleen Morimoto, Marissa Kitazawa, Gil Asakawa. P.C. Editorial Board Chair Gil Asakawa reported that actual P.C. revenue for the year ending 2016 totaled $322,606. The Holiday Issue generated $64,740, up $2,000 over 2015. 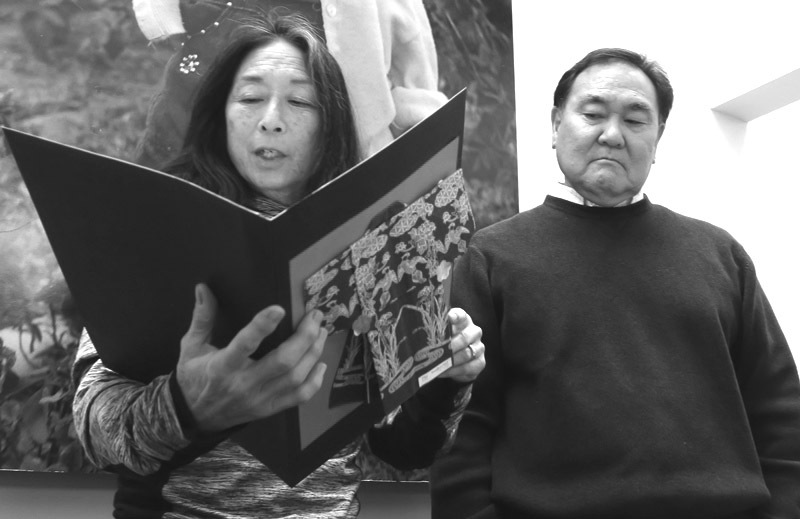 More than $18,000 in commissions was earned by JACL chapters. 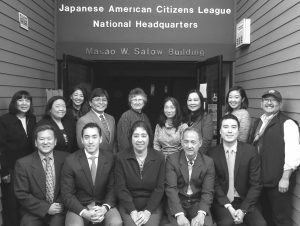 Discussions also centered around ongoing efforts between JACL National Secretary/Treasurer Alan Nishi, P.C. Business Manager Susan Yokoyama and JACL Business Manager Matthew Walters to collectively unify reporting practices by the P.C. and National JACL. Asakawa also announced the P.C.’s intention to hire a new digital content editor in the coming weeks to shore up its staffing vacancy. Nishi reported that the JACL’s reserve fund is $298,000, and his primary concerns for 2017 are accurate budget revenue projections for P.C. revenue, investment income and fundraising. VP Membership Colleen Morimoto summarized that membership was down 2.2 percent in 2016; however, compared to previous years of more than 5 percent, that figure remains hopeful. And VP Planning and Development Matthew Farrells announced that a new fundraising campaign to generate $1 million within the next three years will launch at July’s National Convention in Washington, D.C.
National Staff then recognized Yoshino’s invaluable contributions. 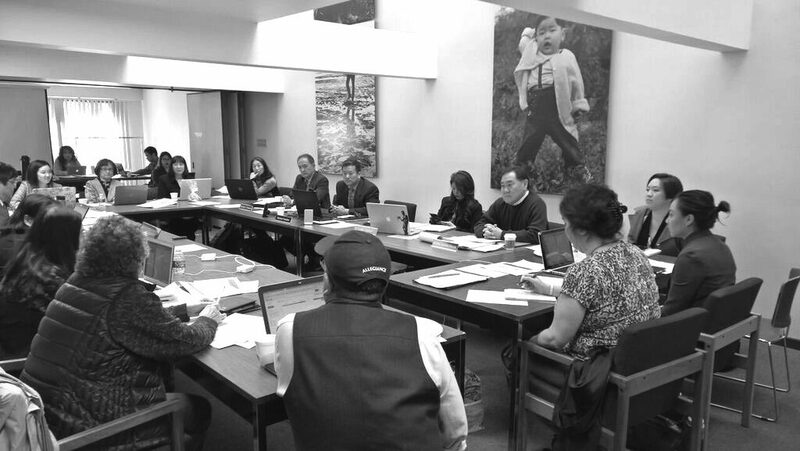 The JACL National Board as it meets at JACL National Headquarters in San Francisco on Feb. 11.